Zoom to the Power of 10 - Innolect, Inc. | Innolect, Inc. Powerful set of question cards to promote fresh thinking and mindful action. 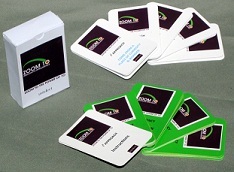 These cards help leaders DIVERGE (Zoom Out) and CONVERGE (Zoom In) when facing new and/or complex challenges. A tool to stimulate new thinking and creative insight.